Hanging feeder baffles shields bird feeders from sun, rain and snow. These Hanging Feeder baffles are used on bird feeder poles as weather domes to help keep bird seed dry. A typical use can be on bird feeder poles and can fit on smaller reach poles. These decorative domes are good for tube bird feeders and small tray feeders. 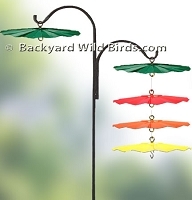 Also nice to use with thistle seed bird feeders or Hummingbird nectar feeders. When using sunflower seeds in bird feeders use on a Squirrel Proof Bird Feeder Pole with a pole baffle below. 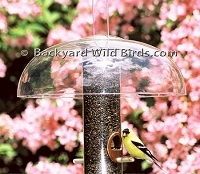 Bird Feeder Weather Baffle is a 15 inch yellow weather shield for hanging bird feeders. Get a pair for a double arm bird feeder pole. 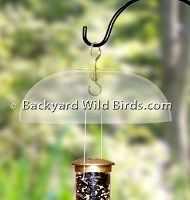 Bird Feeder Weather Dome 12" is perfect for small to mid size bird feeders. 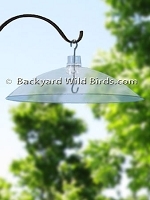 Clear Bird Feeder Baffle is a 16 inch clear plastic weather shield for hanging bird feeders (as shown). A weather baffle is important to keep seed as dry as possible so seed stays fresh. This 18 in. diameter Copper Leaf Baffle adds a classy accent as a Copper Bird Feeder Baffle to your backyard bird feeding. Copper Bird Feeder Dome is a 16 in. diameter copper baffle to compliment your backyard bird feeders with a touch of class. 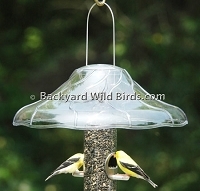 The bird feeder dome works with hanging bird feeders as a weather guard. Fancy Swirl Dome 14 in. Bird Feeder Baffle fits 2 3/4" tube bird feeder to protect bird seed from the weather. Metal Bird Feeder Dome is a 16 in. diameter green baffle to compliment your backyard bird feeders with a touch of class. 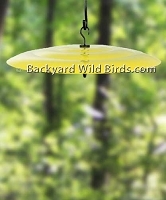 The bird feeder dome works with hanging bird feeders as a weather guard. Tube Bird Feeder Baffle is a 12 in. diameter Tube Top that is for small to mid size tube bird feeders with bail wires on top.